Eureka! 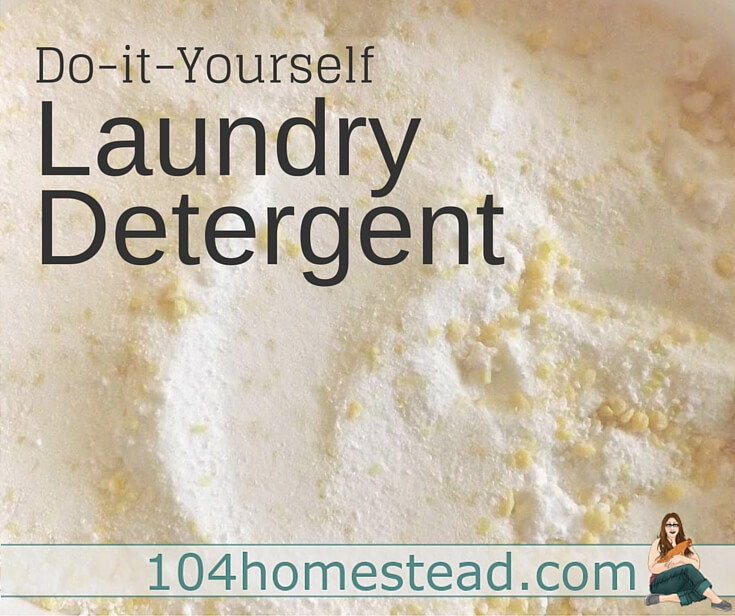 After scouring the internet and testing recipe after recipe, I have finally created a laundry detergent recipe that I like. It’s powerful and I swear it performs better than any commercial laundry detergent I’ve ever used. The best part? I know how to pronounce everything that goes into it. Being a powder, there is no melting, pouring, setting, or other obnoxious steps. Simply measure, mix, and you’re good to go. Some readers have mentioned switching out the Fels-Naptha with homemade soap and having good results. I put it to the test recently and can report that it does work well. I also tried making a batch with my homemade melt and pour soap and it did great as well. Simply mix it into a container of your choice using 1 part Fels-Naptha, 2 parts borax, and 2 parts washing soda. I find the Fels-Naptha is easy to grate with a vegetable peeler or cheese grater, just make sure it’s not going to be used with food again later because your cheese and veggies will taste soapy. Some people prefer to put all of the ingredients in a food processor. Again, make sure it’s one you’ve set aside for crafty purposes only. To use, add 1 tbsp. per medium/light wash load, 2 tbsp. per large/heavily soiled load. This recipe is HE safe using only 1/3-1/2 the above-recommended amount. For front loaders, make sure the soap is finely grated and use the same amount as you would in an HE top loader. Using a whole box of washing soda, a whole box of borax, and three bars of soap makes enough detergent to last my family of five (with two young boys) about six months. This awesome book, The Busy Mom’s Guide to Taming the Laundry Monster, is a great resource for getting laundry under control. I hate doing laundry and it often gets out of control. After reading this book, it’s a bit more manageable. The Not-so-Modern Housewife’s post on Liquid Laundry Detergent, which is practically the same, but in liquid form. Can’t find washing soda locally? Check out How to Turn Baking Soda Into Washing Soda. Also, make sure you check out our other DIY Cleaning Recipes. UPDATE I’m not sure how long this has been available on Amazon, or how long it will last, but they now offer a Laundry Soap Kit that has all these ingredients. 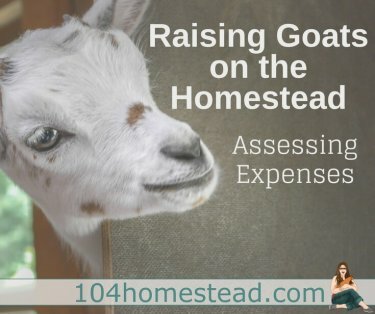 For more DIYs and simple living advice, subscribe to The Homestead Helper, the newsletter that will teach you how to homestead where you live. Do you think I could use my own homemade goat milk soap instead of the Fels Naptha? I haven’t tried it, but I’m sure it would work just fine. The only ones I would stay away from are harsh store-bought soaps. Those contain all sorts of gunk. Homemade thankfully doesn’t have that. Be sure to report back how it went if you try it. I love Fels-Naptha soap! It lifts stains and gets my clothes a lot cleaner. I use a vegetable peeler to shave the soap. It dissolves fine in our cold well water. Thanks for posting the vegetable peeler tip to shave the soap! You’re so welcome. Figuring out that little trick was my saving grace. I started using homemade laundry detergent 2 years ago. I did some experimenting and ended up making powdered detergent that I liked better. I use this same recipe. I’ve had my detergent get old stains out of my husband’s shirts. It’s even gotten the stains from a fire out of a shirt belonging to a friend who is a firefighter. My sister in law loves it so much that she started calling it laundry crack. I have found that in making the powdered version that the Fels-naptha will mix in with the other ingredients better if you put it through a food processor. I used the grating attachment to grate it then put my regular blade attachment in, added the grated Fels-Naptha, Borax and Washing Soda and mixed it all together in the food processor with the blade. I have hard water and have no problem with my Fels-Naptha dissolving. Hi-I just found your blog and I really like it! I have been making my own laundry detergent for quite a while and have tried several recipes and tricks to make it work for me. First of all, we have hard water here and that contributes to graying on whites and light colors. The fix is a half cup of white vinegar in the fabric softener cup. 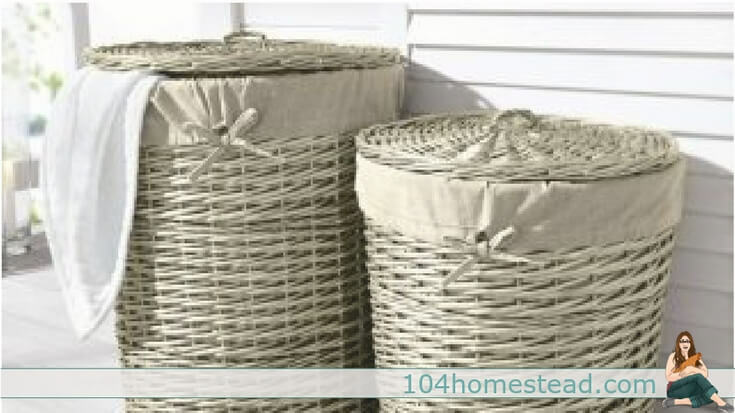 This also deodorizes ands any lingering vinegar scent disappears as the clothes dry. Also helps to line dry in the sunshine whenever possible. One reader noted that the fells naphtha soap doesn’t dissolve in the wash. This very old product was formulated to use in bar form to rub over stains back in the washboard days, so it is made to last, i.e., dissolve very slowly. I find it helpful to let the bars dry out unwrapped for a good long time–months. This makes it a bit crumbly and it will produce smaller bits when grated. It can also be dried for several days after grating then tossed into a blender or food processor to make more of a powder. Be aware that mice seem like to eat this soap, good idea to keep it in a glass jar or metal container. I also grate saved up slivers of bath soap, but bars that are “superfatted” or state they have emollients, moisturizers or butters don’t go into the laundry soap. If I have greasy or oily spots to deal with I pre-treat directly on the stain with dish soap. I think the small quantity used would not produce enough suds to cause problems with an HE washer, but I don’t know. You could always rinse it before putting it in or use the fels-naphtha bar to pre-treat on wet fabric. I have recently learned about a laundry bar called “Zote” that is made in Mexico and has been the go-to there for decades. I have not tried it butplanto pick some upfor my next batch of laundry detergent The #1 advantage is that it does not contain any petroleum distillates like fels-naphtha does. It is available at that big “W” store for less than $1 for a 14 oz. bar. It also comes in a box already grated, 17 oz. under $3. Still a good bargain, especially if you tend to grate your knuckles as I do from time to time! I use this recipe but I use ivory soap instead. It is 99% natural and smells better. I’ve been using it for years and it works great. I have babies and it cleans their clothes perfectly. I’ve never had good luck with this. I ended up going back to another detergent. When I used it as a powder in my front load machine the fels naptha didn’t dissolve. It did not get farm clothes clean and my whites looked awful. I ended up spending way more money on replacing stained and dingy clothes that I saved. I had my water checked and it is well within normal in all areas. I really wanted this to work but it didn’t at all. I’m sorry it didn’t work for you. We’ve had good luck with it, but everyone’s laundry is different. If possible any kind of soap I can grate and put inside the mixture or not? thanks and hope to hear from you. Fels naptha is a laundry soap that contains sodium hydroxide (the lye used to make soap), tallow, coconut oil and/or palm oil. I have heard good things from people about switching it out for homemade soaps like goat milk soap.